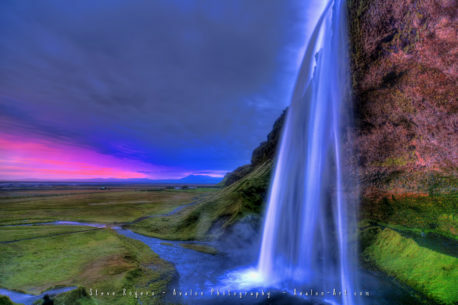 Seljalandsfoss is a waterfall that can be fully encircled, situated on the South Coast of Iceland with a drop of 60 metres (200 feet). Majestic and picturesque, it is one of the most photographed features in all of Iceland. Seljalandsfoss waterfall, part of the river Seljalandsá, has its origins underneath the glacier Eyjafjallajökull. The volcano beneath this ice cap was the one that erupted in 2010 and caused havoc at airports across Europe. The cascade of the falls is relatively narrow but falls from a tall cliff that once marked the country's coastline, the sea is now located across a stretch of lowlands and is visible from the site.